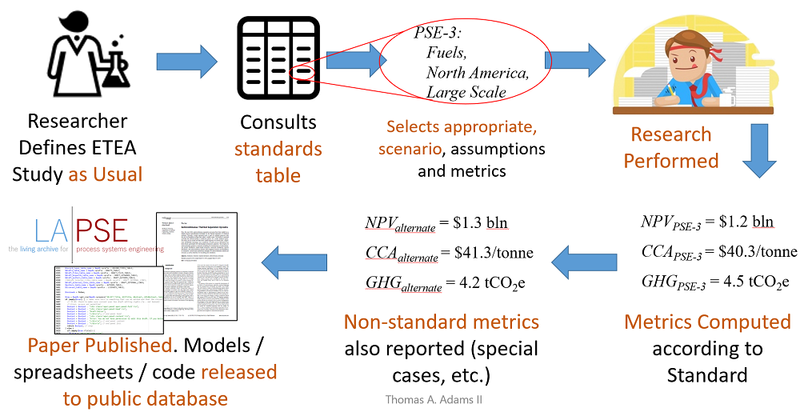 PSEcommunity.org supports the development of a uniform set of standards that are used when conducting Techno-Economic Analyses (TEAs) and Eco-Techno-Economic Analyses (ETEAs) on chemical and energy process systems. The standards would provide a uniform basis for comparing one process design concept to another across literature studies. This is currently almost impossible to do because each individual research study uses its own methods, assumptions, and definitions when performing analyses of proposed process concepts. However, each research study that conducted its TEA or ETEA adhering to this standard could be directly compared to another other, using established procedures, with little effort. April 1, 2019. Lecture at the University of Connecticut: “Finding the Signal in the Noise” by Prof. Thomas A. Adams II. See previous bullet. July 14-19, 2019. A formal call for the development of a standards committee will take place at the Foundations of Computer Aided Process Design (FOCAPD) 2019 meeting at the Copper Mountain Resort in Colorado, USA, from July 14-19, 2019. The presentation will focus specifically on the standardization approach. Slides will be hosted on LAPSE and linked here. July 2019 (Approx). The article “Maximizing our impact: A call for the standardization of techno-economic analyses for sustainable energy systems design research” by Thomas A. Adams II will be published in Computer Aided Chemical Engineering. The article makes the technical case for standardization and contains a more detailed form of the concepts presented at the FOCAPD 2019 conference (previous bullet). Join a committee or working group. We need stakeholders to participate in the technical details of the standardization process. In order for standardization to truly meet the needs of the international research community, we will require volunteers to serve on committees or working groups in a number of organizational and technical capacities. The first call for volunteers will go out in July 2019. Check this page later for more information. Provide feedback and input. Stakeholders can provide advice, input, feedback, and other helpful input to the standardization committee in order to best inform the development of the standard. The committee will, from time to time, put out requests for input. Look for these announcements on this page. Join the Mailing List. You can join the email list here to receive updates and helpful information. We will not publicize your email, sell it, or share with third parties for any purpose. Encourage standards adoption. Once released, everyone can help by encouraging (and using) the standard in your workplace, your classroom, your publications, and in your own work.